I’ve seen some pretty impressive table saw station builds here. While those are nice, I’m just looking for input on a platform to raise my table saw w/ router extension. At first I was considering just getting a sheet of 3/4” plywood (about 26” x 60”) and mounting some casters on each corner and merely placing my saw on it and making some supports for the router table extension end. But I was doubting if 1 sheet would be strong enough. My saw weighs about 250# (Jet JWTS-10). I’m OK with the saw being higher, I’d actually prefer it. I was considering doubling the thickness to 2 sheets. What do you guys think of that? What size and type of casters would you recommend? I’ve heard some can get flat spots on them over time. Are there certain ones to avoid? Thanks for all of the input you guys can provide. 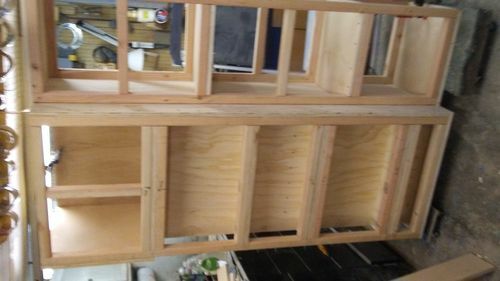 I have not built what you are asking about but if I did I would NOT build it out of only 3/4 plywood unless it was re-enforced greatly in some way. There are others who will chime in and know what they are talking about….pay attention to what they say and you will be happy. I wish I could help more but more help is on the way I am sure. I no longer have this setup, and don’t have direct pics of the platform, but between these two pics and an explanation you’ll get an idea of what I did. I took the frame from an old baby crib, added wheels and a plywood platform under the legstand and another under the router table legs. It worked well and was plenty strong enough. You could make a 2×4 frame to stiffen it up. Rip them so they are shorter than the casters and attach to the bottom of the plywood just inside the casters. Or mount them on the top and go around the footprint of the saw which would also lock the saw in place. Angle iron could be used as well if you want to use less space. 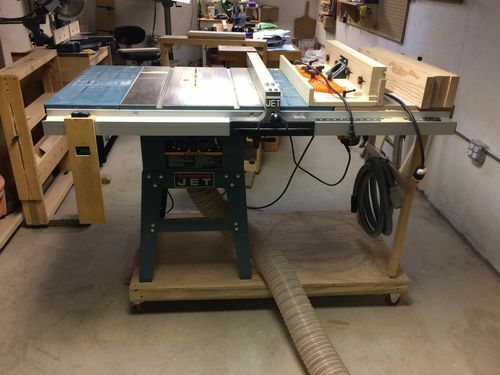 I have the same saw (JWTS-10) with a router table extension on a platform with casters. I’ll take a couple pictures tonight and post it here for you. I built sort of a torsion box—but only skinned one side. The table saw does sit up fairly high—but I’m tall so it’s no big deal for me. 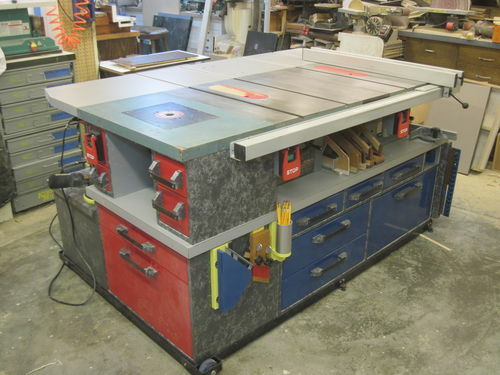 I have the same saw (JWTS-10) with a router table extension on a platform with casters. I ll take a couple pictures tonight and post it here for you. I built sort of a torsion box—but only skinned one side. The table saw does sit up fairly high—but I m tall so it s no big deal for me. Bill- that would be great. I appreciate it. Thanks for the others who’ve chimed in as well. Please keep the info coming. It’s all appreciated. That’s the same exact saw, except I have cast table extensions. Your platform is EXACTLY what I was wanting. Thank you so much for the pictures. What caster size did you use? It looks like you used a 4×4 for the long sections, right? I assume you have 2×4 braces underneath the plywood? Any additional pics you can share and dimensions will be very much appreciated. Rough “torsion box” made of a 2×4 frame skinned with 3/4” ply should be plenty strong enough. I’m pretty sure they are 3” polyurethane casters the overall caster height is around 4”. They are plate casters—swivel and lock on one end and fixed on the other. I’m not sure of the load rating, but if you get something that is 200# per wheel that should be more than enough. I don’t remember where I purchased these specific casters, but I’ve had good luck with the heavy duty casters sold by Woodcraft. Several years of use and so far no flat spotting or cracking. There are lots of places that sell this type of caster (e.g. Lee Valley, Rockler). They might have been 4×4’s or maybe a 4×8 ripped down for the long sections—they are milled down, but you could use 2×4’s as others have pointed out. I have 3 cross braces (2×4’s) on mine. I used glue and pocket screws to attach them to the long sections. Looks like a 3 rung ladder where the rungs are flush to the skinned side. The skin is 5/8” plywood and it’s glued and screwed. You could cut the skin a little over-sized and trim it flush with a router for a clean look. The overall height of my platform is about 6 3/4”—which brings the table saw height to about 41”. 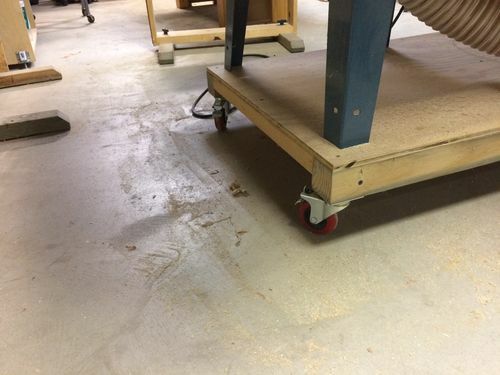 The height of the casters plus the thickness of the materials used will directly affect the height of the platform—so customize them to achieve your desired height goal. The 4” caster height is enough that I don’t bump my feet into it if I stand close (e.g. using router extension) and if something falls/rolls under the platform I can get it out without moving the platform. You might consider using 6 casters instead of 4 since you have the heavier cast iron wings. I notice that my platform gas a little bow in the middle when weighted down—but I have not noticed this translated to the work surface. The space underneath a table saw is generally overlooked and rarely taken advantage of. Your saw is encased in the top portion, the bottom is only a metal base. That can be removed and the saw portion placed on a cabinet base with bracing coming up to meet your extension table on the other side. As other suggested your height can be customized as this is a personal preference not some requirement. To make a cabinet base or a simpler torsion base as someone else suggested use this as your guide. Notice the cross braces others spoke about. You have tools, blades and jigs that you use for the saw. Why not have all of that with the saw handy when needed and free up space elsewhere? It need not be super fancy, again personal preference. But with some time and planning you can create a very useful and practical saw cabinet that will serve your needs for many years. This could be your saw set up. Thanks guys. I’m going to copy Bill’s example. I’m leaning towards using 2×4s, ripping them in half and making the torsion box using them and skinning it in 3/4” plywood. Does that sound like a good idea? That would raise my saw about 6.5”, which should be a good height for me. Any concerns using 1.75” “ribs” for my torsion box? I got so busy over the summer I never built this. Any more comments, especially regarding my last comment?